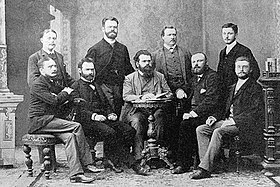 Boltzmann was appointed to the Chair of Theoretical Physics at the University of Munich in Bavaria, Germany in 1890. 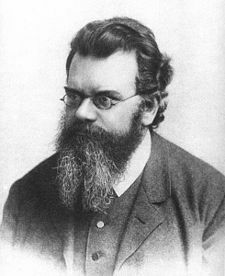 In 1894, Boltzmann succeeded his teacher Joseph Stefan as Professor of Theoretical Physics at the University of Vienna. In 1905 Boltzmann corresponded extensively with the Austro-German philosopher Franz Brentano with the hope of gaining a better mastery of philosophy, apparently, so that he could better refute its relevancy in science, but he became discouraged about this approach as well. 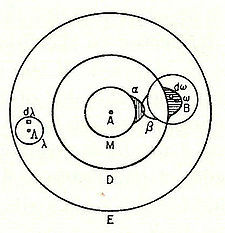 Boltzmann's 1898 I2 molecule diagram showing atomic "sensitive region" (α, β) overlap. denotes factorial.) The "correction" in the denominator is because identical particles in the same condition are indistinguishable. Finally, in the 1970s E.G.D. Cohen and J. R. Dorfman proved that a systematic (power series) extension of the Boltzmann equation to high densities is mathematically impossible. Consequently, nonequilibrium statistical mechanics for dense gases and liquids focuses on the Green–Kubo relations, the fluctuation theorem, and other approaches instead. ^ Južnič, Stanislav (December 2001). "Ludwig Boltzmann in prva študentka fizike in matematike slovenskega rodu" [Ludwig Boltzmann and the First Student of Physics and Mathematics of Slovene Descent]. Kvarkadabra.net (in Slovenian) (12). Retrieved 17 February 2012. ^ Jäger, Gustav; Nabl, Josef; Meyer, Stephan (April 1999). "Three Assistants on Boltzmann". Synthese. 119 (1–2): 69–84. doi:10.1023/A:1005239104047. Paul Ehrenfest (1880–1933) along with Nernst, Arrhenius, and Meitner must be considered among Boltzmann's most outstanding students. ^ Boltzmann, Ludwig (1995). "Conclusions". In Blackmore, John T. Ludwig Boltzmann: His Later Life and Philosophy, 1900-1906. 2. Springer. pp. 206–207. ISBN 978-0-7923-3464-4. Brush, Stephen G. (1970). "Boltzmann". In Charles Coulston Gillispie. Dictionary of Scientific Biography. New York: Scribner. ISBN 978-0-684-16962-0. Darrigol, Olivier (2018). Atoms, Mechanics, and Probability: Ludwig Boltzmann's Statistico-Mechanical. Oxford University Press. ISBN 978-0-19-881617-1. Johnson, Erik (2018). Anxiety and the Equation: Understanding Boltzmann's Entropy. The MIT Press. ISBN 978-0-262-03861-4. Klein, Martin J. (1973). "The Development of Boltzmann's Statistical Ideas". In E.G.D. Cohen; W. Thirring. The Boltzmann Equation: Theory and Applications. Acta physica Austriaca Suppl. 10. Wien: Springer. pp. 53–106. ISBN 978-0-387-81137-6. Lotka, A. J. (1922). "Contribution to the Energetics of Evolution". Proc. Natl. Acad. Sci. U.S.A. 8 (6): 147–51. Bibcode:1922PNAS....8..147L. doi:10.1073/pnas.8.6.147. PMC 1085052. PMID 16576642. Rajasekar, S.; Athavan, N. (2006-09-07). "Ludwig Edward Boltzmann". arXiv:physics/0609047.